For as long as I can remember, I have always followed my bliss, trusted myself, and remembered over and over again that it all starts with me no matter what I wanted to do. A lot of tenacity didn’t hurt, either. Despite an occasional setback in my life, nothing deterred me very long from enjoying the world and its people. As a result, my perspective changed considerably on subjects such as religion, philosophy, art, literature, ethnicity, politics, money, even myself. I had always kept diaries, letters, and scrapbooks. Therefore, when I decided to write my autobiography, I realized they would be invaluable to my research. In fact, a treasure chest. In the book I’ve written about the most memorable events and people in my life. I guess it’s never too late to say “Thank You” to those people who, one way or another, gave me a helping hand. They were the book’s inspiration. 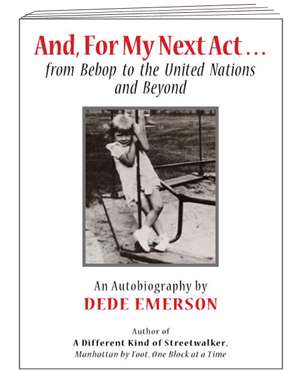 The book’s title, And, For My Next Act best describes the very dissimilar interests I’ve had in my life such as being a jazz pianist, having a 30-year career with the United Nations, walking all of Manhattan, being a tax counselor, and a published author. Life was never boring. These “acts” resulted in a life beyond my expectations. I have no idea what my next act will be. But, there will be one. I’m anxious to see where it leads me.